Every home cook needs a core of reliable favorites to execute flawlessly. Through clear instruction and photography, this collection provides the tools for making 100 perfect, reliable, and foolproof dishes, from the creamiest mac and cheese to the most flavorful fish tacos. Photo tutorials walk readers through key steps of the process to take the mystery out of achieving perfect results. Secrets from the Test Kitchen — what works, what doesn’t, and why — are sprinkled throughout to provide additional keys to success. “Eight to Try” features provide riffs on a theme, proving that once home cooks have mastered the basic techniques, the opportunity for customization is truly endless. 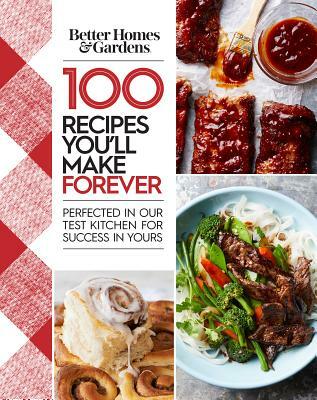 In all, readers will have not only 100 excellent recipes for traditional and new classic breakfasts, lunches, dinners, snacks, sides, and desserts, but invaluable lessons from the BHG Test Kitchen as well. Full nutrition information rounds out this comprehensive package to instill confidence in every home cook.